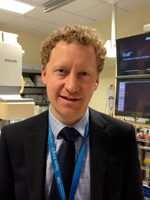 Ian Webb is a Locum Consultant Interventional Cardiologist at King's College Hospital, London. He graduated in 2000 from the University of Oxford and subsequently trained in Cardiology, including coronary and structural intervention, in London and New Zealand. During advanced training, he was a BHF Clinical Fellow at King's College, University of London, and was later awarded a PhD in molecular cardiology.